New Writing Resources for the School Year! 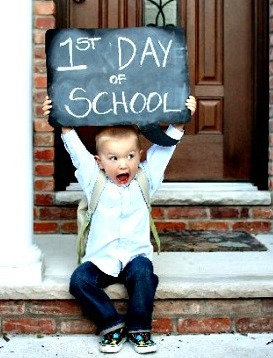 As former teachers, our team still feels that tingle of excitement at the start of a new school year. I think it’s the tingle of p-o-s-s-i-b-i-l-i-t-y. When we were children, each new school year brought a chance to reinvent ourselves socially and academically. As educators, each new year brings a chance to reinvent our teaching. Each new school year also brings c-h-a-n-g-e. Change stretches us, but it can also reconnect us to a higher purpose. Remember why you started teaching? We do. It’s about the kids. We’ve been developing new lessons this summer to stay on top of our game so they can stay on top of theirs. We’ve been hard at work developing new lessons for the new school year in response to ongoing clarifications of the English language arts Common Core standards. We’re beefing up our research writing units with new introductory activities. But that’s not all. Now, teachers can also use Prezi to enliven their presentation of research concepts. “These Prezi lessons are really engaging, and they include new material and get-up-and-go activities,” says WriteSteps Curriculum Creator Denise Dusseau. The Prezi lessons adhere to Common Core guidelines for informational writing and increase in complexity each year. You can see the interactivity of Prezi by looking at this presentation from an educator’s conference earlier this year. The new lessons include activities and talking points for teachers. They’ll be available later this fall on eWriteSteps, our web portal of Common Core writing resources. Last month, we also shared free technology platforms to publish student writing that meet the Common Core standard for publishing with digital tools. If you missed it, check out “Four Free Technology Tools to Jazz up Your Writers Workshop” as well as our blog post featuring KidBlog, an interface so simple, even first graders can use it. These tools are now posted in eWriteSteps. 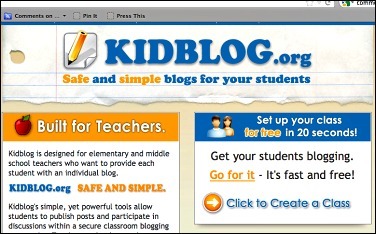 Screen shot of the KidBlog.org website, one of several digital tools we recommend for publishing K-5 writing in adherence to the Common Core standards for using technology. We’ve also developed new lesson extensions for informational and opinion writing in keeping with our ongoing commitment to bring you the best possible Common Core resources. Here’s why. In spite of clarifications last spring by CCSS ELA authors David Coleman and Susan Pimentel, there remains a good deal of confusion among teachers and school leaders about the writing standards. For example, we find curriculum directors who don’t realize that argument isn’t taught until middle school, or that its K-5 equivalent, opinion writing, is a different animal. There is also some confusion and a lot of hand-wringing among teachers ever since Coleman and Pimentel stated that the ideal balance of text types in elementary ELA is 35% Narrative, 35% Informational, and 30% Opinion. Many teachers have wondered if this means they have to throw out huge chunks of literature and narrative writing. We think not. Lucy Calkins and her colleagues, in Pathways to the Common Core, note that the standards emphasize “writing instruction belonging in the hands of all disciplines.” Their careful analysis concludes that much of the explanatory and informational writing will occur in science, social studies, reading, and even math. This is the screen WriteSteps teachers now see when they log in to their eWriteSteps accounts. It lists lesson updates teachers should download for their grade level. This fall, teachers will be equipped with new material on technology resources, writing across the curriculum, and research writing. Our new third, fourth, and fifth grade lesson extensions provide a framework teachers can use specifically to apply informational and opinion writing skills in science and social studies. Because they are flexible, teachers can create endless adaptations of them, decide how much practice their students need, and choose whether to teach them during writers workshop or during other disciplines. However teachers use them, the lesson extensions connect the dots and ensure that students can get the practice they need to be ready for Common Core tests. If you’re already using eWriteSteps, you’ll find these when you log in. 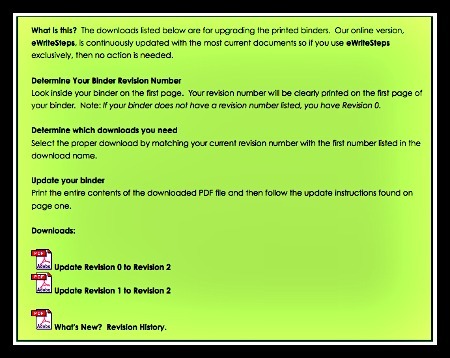 If you primarily use the WriteSteps print binder, be sure to go to eWriteSteps and download the new lessons for your binder. We have plans for more new lessons later this year, so check back frequently to stay current! A WriteSteps Contest — Be a Star! We know from experience that one of the best ways to stay on track is to learn from fellow teachers. With this in mind, one of our goals is to celebrate excellence in teaching with a new initiative called TeacherStar©. We’ll be asking teachers to submit videos of themselves teaching WriteSteps lessons. Are you ready to take the next step and share your writing lessons with colleagues? Contest winners will be recognized on our Website, receive district recognition and other prizes, and have their lessons included on eWriteSteps. Stay tuned for more details in our October e-newsletter, and start thinking about what you may want to submit! Meet WriteSteps Research and Development Specialist Robert Villa, who loved reading and writing from a young age. Robert started reading newspapers in the second or third grade and discovered writing early, too. 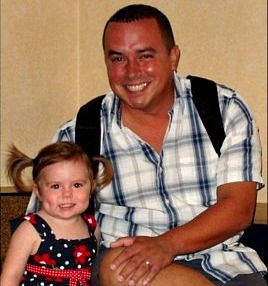 WriteSteps Research and Development Specialist Robert Villa with his daughter Ruby. Robert wrote in a journal and says he was also lucky to have a psychology teacher in high school who gave his class a writing prompt each day: What’s the happiest you’ve ever been? What’s the maddest you’ve ever been? What’s something you’re really proud of? He remembers the writing as a wonderful practice that helped him know who he was and what he wanted. Formerly a research assistant for Shearman & Sterling LLC in New York, Robert now lives in Los Angeles and is familiar to many teachers as the friendly person who sets up eWriteSteps accounts. He also conducts research for product development and marketing. His wife, Carrie, is a psychologist who frequently works with schools writing educational assessments for kids experiencing learning challenges. They have a daughter, Ruby, who will be three in December, loves books, and is starting pre-school this week. Besides work and family, Robert’s passions are biking and Michigan football. He returns to Michigan several times a year to attend games, where he sees his favorite teacher, Mrs. Furkioti, who “was always a smiling face and made sure I was doing the right thing and keeping my grades up, all the way through sixth grade,” Robert recalls. 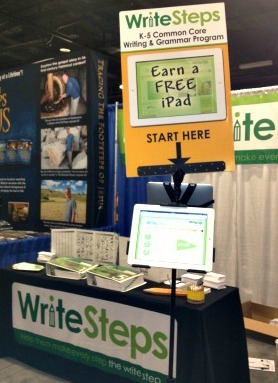 Come meet WriteSteps team members, try our eWriteSteps teacher portal to online lessons and videos, and register to win lessons, iPads, and other prizes. Drop by the WriteSteps booth at one of these fall conferences, try out our web-based teacher portal for K-5 writing resources, and learn how you can win an iPad for your classroom! Curriculum Creator and third-grade teacher Denise Dusseau will exhibit at the Indiana Charter Schools Conference and Expo. Awareness Ambassador Ben Kutz will exhibit at the Missouri Charter Public School Association (MCPSA) conference. Curriculum Creator and third-grade teacher Denise Dusseau will exhibit and present at the Michigan Association of Non-Public Schools 2012 General Conference.